Were you in Napa, California for the Bottlerock Music Festival this past weekend? Our own Teagan Thompson was, and she put together a recap of the fun in the sun. The sun was hot and the beer was cold in Napa Valley for last weekend’s Bottlerock Music Festival. The three-day festival featured a wide variety of music, food, wine, and, of course, beer. Anchor Brewing was a key beer sponsor, pouring a tasty selection of Anchor brews for thirsty festival-goers. 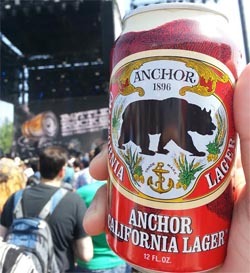 Anchor Steam Beer, Anchor California Lager, Anchor IPA, Anchor Saison, Liberty Ale, and Anchor Porter were poured in the Bottlerock Craft Beer Area, as well as at the Anchor Brewing Bar next to one of the four music stages. Anchor also hosted the Anchor Brewing Silent Disco. So what’s a silent disco? Rather than using a speaker sound system, music is broadcast via radio transmitter to wireless headphones worn by the participants. Those without the headphones hear no music, giving the effect of a space full of people dancing in silence, but to those with headphones on, it’s a real party! The silent disco was powered by our friends at Silent Storm Sound System, who provided their custom 3-channel wireless headsets, allowing participants to choose from three different channels of music from local DJ’s and producers Uncanney, Brian EYE, High Society, MPHD, Jay Huffman, and vinae. 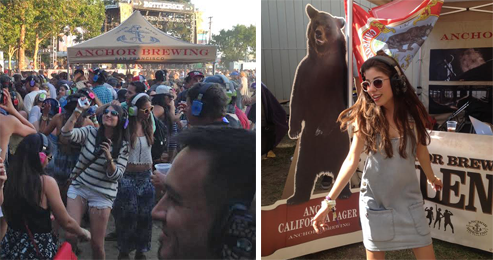 The Anchor Brewing Silent Disco offered more than just a groovin’ good time. Participants were also encouraged to “disco by donation” by contributing to the California State Parks Foundation. This extended Anchor’s ongoing efforts to encourage craft beer enthusiasts to help parks nationwide by purchasing Anchor California Lager®, California’s first genuine lager reborn. Through two unique partnerships, a portion of proceeds from Anchor California Lager sales support the National Parks Conservation Association and the California State Parks Foundation. Thanks to everyone who joined us in Napa and helped us support our parks!